One of my kids was having a bad day today when he got home from school. He won't tell me what happened at school, but he was moody and I let his mood affect mine and the whole afternoon could have gone to ****. Instead of letting the afternoon get away from us, I thought maybe we could use a little "settle down" time and maybe a little hot cocoa. I know it's easy to buy those premade packets of cocoa, but we were out of them and I would prefer to make my own so that I know exactly what goes into it anyway. 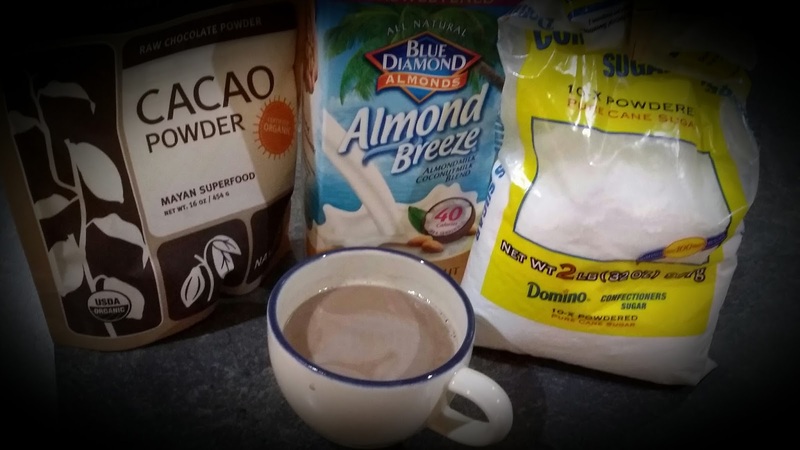 This version of hot cocoa uses Reduced Sugar Vanilla Almond Milk, Organic Cacao Powder and powdered sugar. It's super quick and easy to make on the stove. We have a little sauce pan that has the pouring side that make it easy to pour into cups. We made 12 ounces total and ended up splitting it between the three of us. If you use smaller coffee cups, 4 ounces each is the perfect amount. Combine all ingredients in small saucepan and cook over medium heat while continuously whisking until thoroughly combined and warm~~about 3 minutes. If you divide this into 2 six ounce portions, here's the calorie and nutrition breakdown. Note: The calories and sugar are similar to the premixed packets. The health benefits would come from choosing your own organic ingredients to make this with. 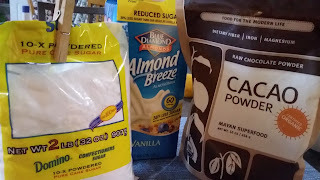 Organic almond milk would be a better choice for almond milk and of course organic sugar would be better.. . . . . or stevia if you're into stevia. (At this point in time I don't have organic almond milk OR organic sugar in the house. We're working on buying more things organic.) An even lower sugar, lower calorie version is listed below this one and is made with Almond Coconut Milk. The GREAT thing about making it this way is that you can adjust the amount of cocoa powder and sugar to suit YOUR taste!! Of course that will change the calorie and sugar amounts. 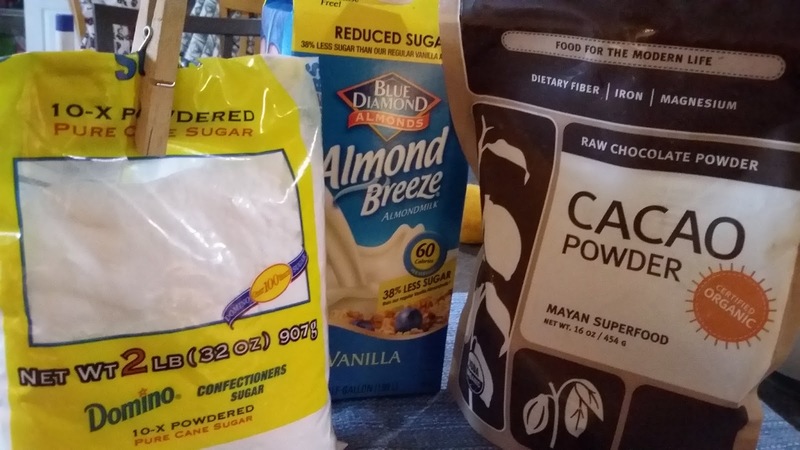 We realized that we like it with less sugar and less cocoa, which would of course lower the overall calories and sugar than we have listed here. 150 calories, 2.6 grams of fat, 24.5 grams of sugar, 2.75 grams of fiber and 2.25 grams of protein. If you divide this into 3 four ounce portions, here's the calorie and nutrition breakdown. 100 calories, 1.75 grams of fat, 16.33 grams of sugar, 1.83 grams of fiber and 1.5 grams of protein. My kids thought that it was too chocolate-y. I loved it though. We also thought maybe it was a little sweet. So, although it was extremely good the way it was (to me! 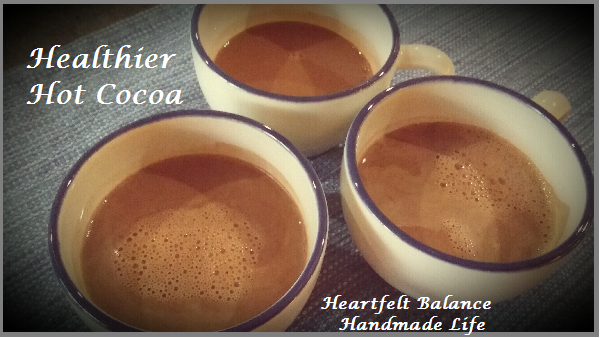 ), we tried adjusting the cacao and sugar to make it a little less chocolate-y and a little less sweet. As a second choice, you could use Unsweetened Coconut Almond milk. This is a less sweet version and has fewer calories. 102 calories, 2.9 grams of fat, 14.5 grams of sugar, 1.55 grams of fiber and 1.35 grams of protein. 68 calories, 1.95 grams of fat, 10 grams of sugar, 1 gram of fiber and .9 grams of protein. Do you enjoy hot cocoa every now and then? Hot cocoa is a good way to chase away the blues. I've never tried it with Almond Milk but I definitely might!